moderate growth. The industry is moving forward. that the bottom has been reached, with 2012 showing 3.5% growth over 2011.
total of 7% and 8.9% growth, respectively. the tabulation of survey data. of such a broad nature. decline in 2009 was potentially deeper than originally reported. 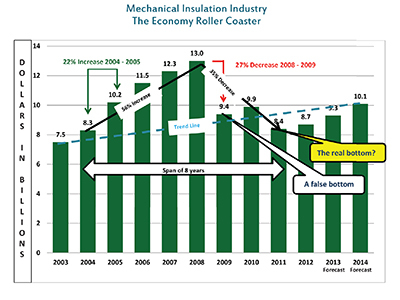 what we assume/hope is the bottom of the recession ($8.4 billion) in 2011.
manufacturing segment is not known, but it is expected to be in the same range. require more extensive finishing systems. 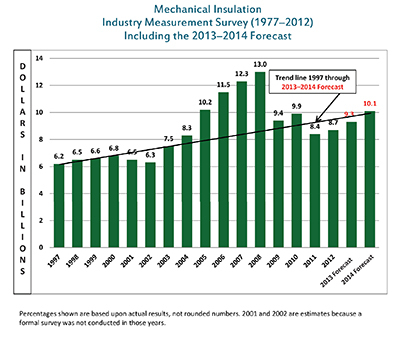 with the overall commercial and industrial construction market forecast. are optimistic and refreshing after four rollercoaster years. issues would have contributed to the 2011 decline. with the potential for sustained growth.